For an automatic invocation of Web services, concrete platforms allow the client-side generation of stubs by means of suitable primitives of programming languages. In this setting, we propose a framework that preserves static and dynamic integrity constraints of invocation parameters. 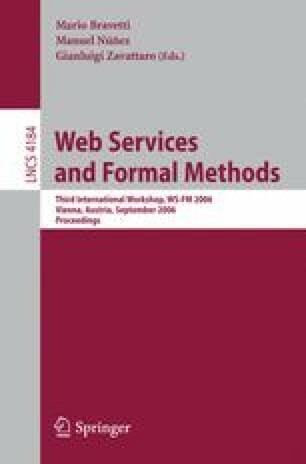 The main ingredients of the framework are: (i) WSDL , a Web services description language that describes the interface, the semantics and the protocol for invoking Web services, (ii) CLiX , a language for constraints specification in XML that allows the specification of static and dynamic integrity constraints of Web service parameters by means of logic formulas; (iii) reflection mechanisms for managing complex user-defined types. The proposed framework is entirely based on XML-based technologies and allows only provably correct Web services invocations be forwarded by client-side checking CLiX formulas. This work was supported by the Investment Funds for Basic Research (MIUR-FIRB) project Laboratory of Interdisciplinary Technologies in Bioinformatics (LITBIO) and by Halley Informatica.